And what kind of respect are we talking about? The kind we feel out of honor or the kind we feel out of fear? Parents/leaders/employers/elected officials/etc. often demand respect failing to realize that they have to EARN it. So this begs the question, how well do we respect ourselves? Do we treat ourselves with honor and appreciation? Or do we often put ourselves down, act in a way that demonstrates low self worth or esteem. Are we really eating that that second helping of dessert because we honor and respect ourselves? How would our behavior change if we truly appreciated ourselves? Which then leads into how well do we respect others? Have you watched the news lately? We have a lot of work to do. Our country, our world is so divisive, so out of touch with each other that as a society we tend to be disrespectful to anyone who is different or thinks differently. Even within our own inner circle of friends and neighbors, are we doing all that we can to be considerate/appreciative of them…regardless of how inconsiderate they may be to us? I know it’s a tall order. So let’s start with ourselves. Let’s be more respective of and to ourselves. We all have value. When we learn to honor ourselves, we will in turn learn how to honor others. If this process requires that we stand up to someone for the first time, let’s do so with respect even if we fail to receive it in return. Know that sometimes the most respectful thing we can do in a given situation may be to walk away, to let them go. 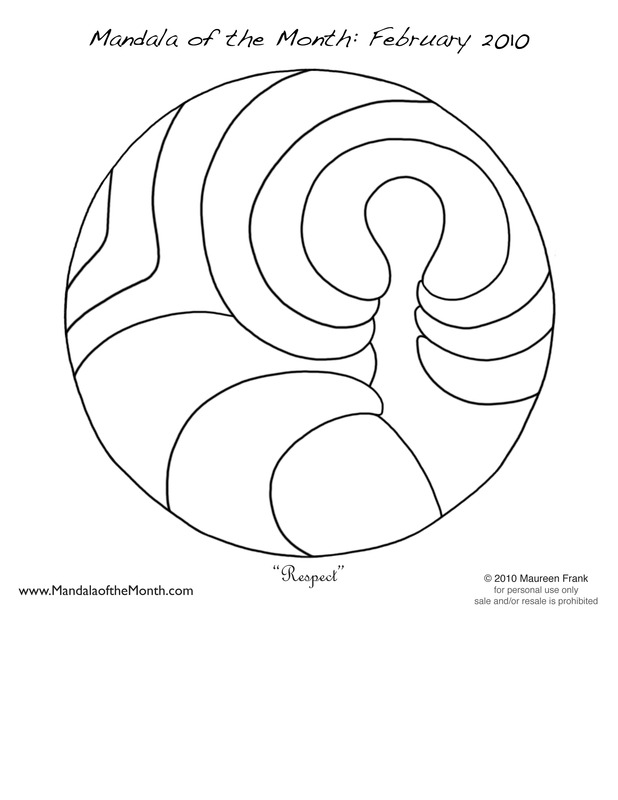 Ponder the word respect…”find out what it means to you” as you color this month’s mandala. Hello. This is a lovely blog site. I had fun coloring the February mandala digitally and posted it on your Flickr site. Mandala creation has been an ongoing source of meditation and creativity for me. Digitally producing mandala art from my photography is especially exciting. What an amazing world of textures and colors to pick from. I hope you don’t mind that I added a link to your blog from my blog which I just started recently. My site is at julciasmandalas.wordpress.com. I’m looking forward to being creative with more of your mandalas. Thanks. Thanks, Julskovac. I checked out your february coloring…and it definitely looks like you had fun with it!